Woman Seeks Help for Post-Partum Depression. A Nurse Calls the Cops. With her first daughter, everything was fine. But four months after having her second, Jessica Porten started feeling really irritable. Little things would annoy her, like her glider chair. She read online that this could be a symptom of post-partum depression – a condition that affects up to one in five women in California during or after pregnancy. 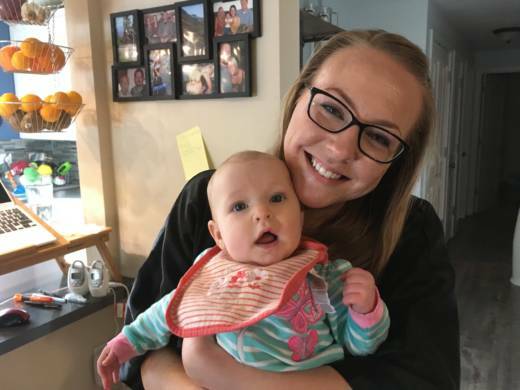 The rates have spurred state lawmakers to introduce a package of bills to improve mental health screening and treatment for new moms. She went to Capital OB/GYN, a women’s clinic in Sacramento that takes her Medi-Cal coverage, to talk about medication options and therapy. She admitted to the nurse that she was having some violent thoughts. The nurse called the police. The police escorted Porten and her baby to the Sutter Emergency Room. Hospital staff made her change into a gown and took her purse, but they let her keep her diaper bag for the baby. They put them both in a room, under constant watch. "It’s like, everybody knows I’m not crazy," she said. "Everybody knows that this is normal, but they’re following protocol." Finally, at midnight, 10 hours after she first got to the doctors’ office, a social worker sent her home. She wrote on Facebook that the whole thing made her feel like a criminal. Administrators at Capital OB/GYN declined to comment. A spokesman for Sutter Health, Gary Zavoral, said once a patient arrives in the emergency room for assessment, hospital staff must follow strict protocols. When patients reference violent thoughts, it forces doctors to think about things in a different way, said Melanie Thomas, a psychiatrist at UC-San Francisco and Zuckerberg San Francisco General Hospital. The laws and medical protocols don’t always line up, Thomas said. There have been times she felt asked to put legal reasoning over her clinical judgment. “The fragmented aspects of our system of care make it difficult to get women the help that they really want,” she said. That’s one reason lawmakers in Sacramento are now introducing a package of bills to address maternal mental health. Assemblyman Brian Maienschein, R-San Diego, is backing two of them. One would require doctors to screen new moms for depression – under current law, it’s voluntary. Maienschein's other bill would direct the state to tap into a new federal pot of money set aside for post-partum programs and awareness campaigns. It was established in the new 21st Century Cures Act. "Getting federal money is a great thing," Maienschein said. "It’s federal money that’s available that I’d like to see California have versus another state." “I walk into that waiting room and I see tons of Medi-Cal recipients, so they’re all low-income,” she said. "If I sue, it's only going to cause monetary damages to a facility that is clearly short on resources." Instead, Porten will advocate to get the new bills passed in California. She thinks that's the way to help the clinic's physicians and nurses do a better job helping new moms get the care they need.